is Dickason professor in the humanities, professor of classics and history, and a Catherine R Kennedy and Daniel L Grossman fellow in human biology, as well as director of graduate studies in classics, all at Stanford University in California. His latest book is The Great Leveler (2017). Blame inequality on climate change. Until the end of the last Ice Age, some 12,000 years ago, our ancestors lived in small foraging groups. They moved around a lot, owned very little, and passed on even less to the next generation, sharing any windfalls on the spot. The Holocene changed all that. Rising temperatures allowed humans to settle down to farm the land and domesticate livestock; collective management of resources gave way to private property rights, and new norms made assets hereditary. Over time, the cumulative rewards of brain, brawn and luck came to separate the haves from the have-nots. This process of stratification was reinforced by the creation of states, as political power and military muscle aided the acquisition and preservation of fortunes and privilege: more than 3,000 years ago, the ancient Babylonians were well aware that ‘the king is the one at whose side wealth walks’. With the emergence of mighty empires, and as slow but steady increases in the stock of knowledge expanded economic output, the concentration of income and wealth reached previously unimaginable heights. The principal sources of inequality have changed over time. Whereas feudal lords exploited downtrodden peasants by force and fiat, the entrepreneurs of early modern Europe relied on capital investment and market exchange to reap profits from commerce and finance. Yet overall outcomes remained the same: from Pharaonic Egypt to the Industrial Revolution, both state power and economic development generally served to widen the gap between rich and poor: both archaic forms of predation and coercion and modern market economies yielded unequal gains. Does this mean that history has always moved in the same direction, that inequality has been going up continuously since the dawn of civilisation? A cursory look around us makes it clear that this cannot possibly be true, otherwise there would be no broad middle class or thriving consumer culture, and everything worth having might now be owned by a handful of trillionaires. Did democracy and progressive reform save us from this unenviable fate; or was it the labour movement, or mass education? All of these developments played an important role, and yet, at best, furnish only part of the answer. For inequality had already dipped steeply on several occasions, long before any of these modern breakthroughs had begun to appear. From time to time, it turns out, history has pushed a reset button, driving down inequality in marked, if only temporary fashion. It is only by surveying its full sweep, over thousands of years, that we can discover the dynamics that drove this process. And these dynamics turn out to be very disturbing indeed: every time the gap between rich and poor shrank substantially, it did so because of traumatic, often extremely violent shocks to the established order. Catastrophic plagues, the collapse of states and, more recently, mass-mobilisation war and transformative revolution, are the only forces that ever levelled on a grand scale. No other – and less bloody – mechanisms have even come close. In a time of rising inequality, what does this imply for our own future? But let us start at the beginning, in the very distant past. Europe is by far the best-documented case (see Figure 1 below). Economic inequalities emerged as farming spread from the Middle East around 9,000 years ago, and grew as the land filled up and small communities coalesced into larger societies. Archaeologists have discovered enough elite burial sites with luxury goods that had been manufactured for the privileged few and traded over long distances to support this reconstruction. The Roman empire was the culmination of this very drawn-out process. To the present day, no one state has come as close to monopolising political power in Europe as Rome did: for centuries, as many as four out of every five Europeans were ruled by the Caesars. Wealth concentration at the very top far outpaced the growth of the economy: between 200 BCE and 100 CE, the largest reported fortunes of Roman plutocrats rose by close to a hundredfold while the population of the empire went up merely tenfold. Some aristocrats owned thousands of slaves, more than even the biggest planters of the antebellum South. In terms of personal net wealth, the richest among them were as remote from the common man as Bill Gates is from the average American today. By some measures, this trend continued all the way up to the fall of the Roman empire, as private palaces replaced mansions, and estates swallowed up entire towns and villages. Until it all fell apart. In the 5th century CE, a terrifying array of disasters – internal strife, barbarian invasions, climate change – brought down the western half of the empire. The vast fortunes of the super-rich (early globalisers who owned property and invested capital all over the Mediterranean) vanished. To make matters worse, 100 years later bubonic plague first entered Europe, a raging pandemic that carried off a large share of its population. The disease killed so many workers that the price of labour soared, while that of land, now abundant and bereft of cultivators, plummeted, leaving the masses better off and landlords poorer. In Constantinople, the Byzantine emperor Justinian tried in vain to hold down wages by government decree. Papyrus documents from nearby Egypt show that the real incomes of ordinary farm hands rose by 150 per cent. A millennium of raging Roman inequality was undone in prolonged agony and dislocation, a period somewhat unfashionably but not entirely misleadingly known as the Dark Ages. The narrowing of the gap between rich and poor came at a high price, as material culture declined and insecurity spread: cities shrank, trade flows dried up, and imperial peace and order gave way to conflicts between local strongmen. At the same time, this cataclysmic adjustment set a pattern that would repeat itself through history: inequality tended to rise unless and until this process was reversed by a severe shock – but only for as long as the impact of that shock made itself felt. Thus, when the plague subsided at the end of the 8th century, elites once again began to accumulate wealth and power, and the familiar cycle resumed. Population numbers recovered, thereby depressing wages, and cities and trade expanded, offering gains for the well-positioned few. Lords, in turn, downgraded peasants to serfs, and debt-ridden farmers who had lost their land were compelled to work for bare subsistence. By 1300, the peak of the High Middle Ages, Christian Europe was probably once again about as unequal as it had been under the Romans: and, once again, economic development coincided with rising disparities in income and wealth. We cannot tell how long this phase would have continued had the plague not returned in the 1340s. Ominously known as the Black Death, it swept through Europe cutting down one in three people, and probably more in England and Italy. In the words of Agnolo di Tura, a chronicler from Tuscany, who lost his five children to the plague: ‘So many died that all believed it was the end of the world.’ But end it did not. It merely readjusted. Workers called for higher wages and tenants sought lower rents, while hopeful edicts to keep the lower orders in their place proved fruitless. This did not go down well with the rich. In the 1390s, the English chronicler Henry Knighton sniffed: ‘The workers were so above themselves and so bloody-minded that they took no notice of the king’s command. If anyone wished to hire them he had to submit to their demands, for either his fruit and standing corn would be lost or he had to pander to the arrogance and greed of the workers.’ What seemed like greed to the elite brought much-needed respite to the labouring masses. In England, real wages for workers more than doubled (see Figure 2 below). Contemporary accounts draw a vivid picture of the benefits this brought: the customary diet of bread was greatly enriched by meat pies and ale. Elitist observers complained that fur coats, formerly the prerogative of the rich, became widely popular. 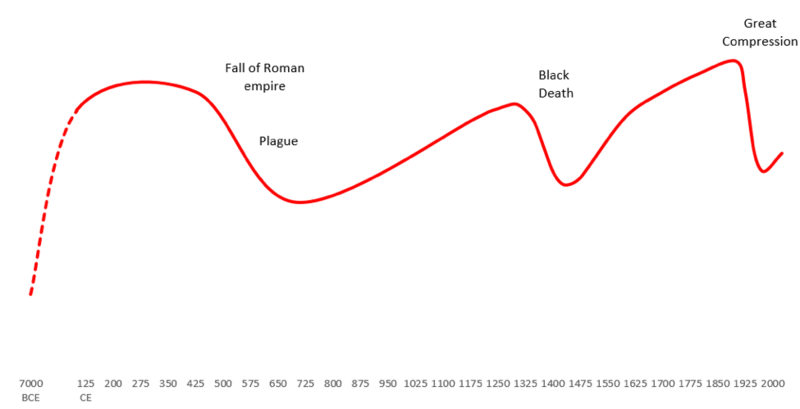 The age of the Black Death produced the earliest direct statistical evidence for the attendant compression of wealth. Many city-states of Italy had long assessed their citizens’ assets for tax purposes, and some of these records have survived to the present day. 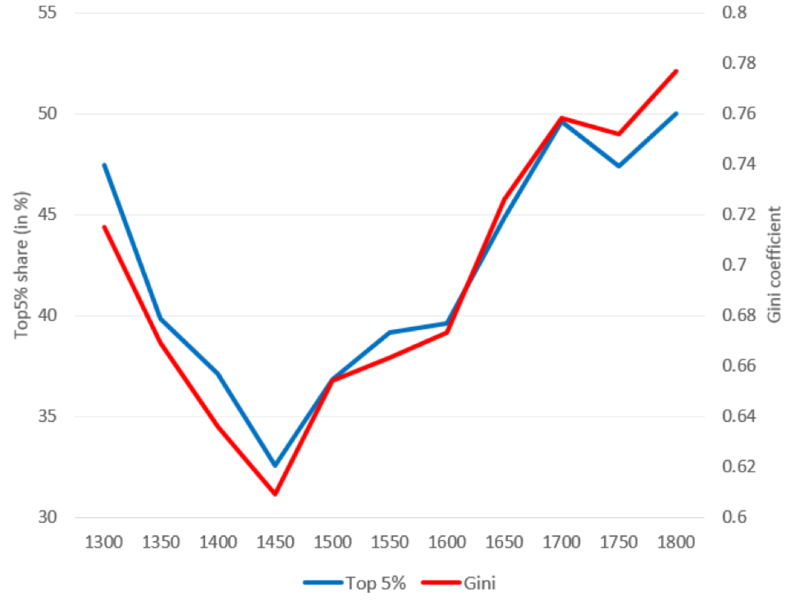 Data from Piedmont, in the Italian northwest, convey a clear impression of levelling: as in England, the fortunes of the rich declined in the wake of the plague as demand for land and other fixed assets fell (Figure 3). But both these charts also reveal the next act of the drama. As soon as the epidemics abated and population growth resumed, real wages dropped and wealth concentration once again increased. Consequently, the end of the Black Death in Europe ushered in another extended phase of growing inequality, which continued steadily and with only little regional variation for more than 400 years. On the back of this disparity, Western Europe became the hub of a global network of exchange and colonial exploitation, and mercantile elites made the most of it. Later on, industrialisation likewise rewarded capitalists who seized the day, while older forms of wealth such as landownership continued to end up in ever fewer hands. The rising tide of modern economic growth lifted boats unevenly: even as living standards improved across society and many workers escaped the dire poverty that blighted the lives of their ancestors, the rich pulled ahead even faster. ‘Trickle-down economics’ was not enough to solve the problem. Nor was government intervention: modest political reforms and fiscal measures were incapable of stemming the tide and, until the 20th century, states lacked the capabilities required to undertake redistribution on a large scale. For all these reasons, by the start of the First World War, recorded imbalances exceeded anything that had come before. In England as well as in France, the richest 1 per cent held almost three-quarters of all private wealth while most people owned virtually nothing. Together, the two world wars of the 20th century caused what economists studying the distribution of income and wealth have dubbed the ‘Great Compression’, resulting in massive levelling. Wartime mobilisation, dislocation and aggressive government intervention drove down returns on capital. Desperate governments imposed confiscatory taxes on the highest incomes and largest estates to fund the war effort, and ensure a degree of shared sacrifice. Wage premiums for the better-educated contracted sharply as demand for lower-skilled workers rose. Rationing schemes and controls on wages, prices, rents and dividends equalised access to material resources. In many countries, the massive destruction of physical capital from factories and housing stock to merchant shipping owned by the wealthy further reduced their fortunes, and inflation repeatedly wiped out rentiers. Much of this happened during the actual war years, but after 1945 inequality often continued to decline more gently for another generation. This is easy to explain. It took high inheritance taxes a while to gnaw their way through accumulated wealth. War triggered extensions of the franchise and greatly boosted labour union membership, which (averaged across OECD countries) reached a historic peak around 1945. The welfare state, previously just a glimmer in reformers’ eyes, was made possible by the enormous increase in fiscal heft and organisational capacity brought on by industrial-scale warfare: spending shifted from guns to butter as voters made sure they were compensated for their shared suffering. Social solidarity, elusive as it might be to measure, appears to have been enhanced by this experience. No modern economy remained immune to the fall-out from war. Even Sweden, famously neutral in both world wars and untouched by revolution, and often invoked as a comforting example of peaceful levelling, could not escape the pull of its troubled neighbourhood. The meltdown of Germany and Russia after the First World War triggered economic and political problems that paved the way for later reforms. In the Second World War, the country, wholly surrounded by Axis powers, resorted to full mobilisation, rationing, very high taxes and economic planning to prepare for the worst. Just as elsewhere, once the dust had settled, voters harnessed these interventions by directing them toward social welfare. What makes Scandinavian countries stand out is not so much the origin of their high levels of equality but their success in maintaining them ever since. In the US, the Second World War introduced a dramatic compression, which was then sustained for another generation. Elsewhere, the world wars unleashed transformative revolutions of unprecedented ferocity. Communists who expropriated the rich (and often killed them in the process) at first handed out confiscated land to the poor but soon changed their minds, and nationalised assets from farms to industries. By establishing centrally planned economies that set all prices and wages, they levelled on a dramatic scale. In turn, fear of communism precipitated equalising policy responses, not only in the West but also in developing countries. In Taiwan, the nationalists who had fled the mainland introduced ambitious reforms to appease the local citizenry. Much the same happened in South Korea, which was also devastated by the Korean War. Thanks to the twin shocks of mass-mobilisation warfare and transformative revolution – and the redistributive institutions they engendered – income and wealth were much more evenly distributed in the postwar decades than they had been before. This process, however, was not universal. In Latin America, which had been spared active involvement in the world wars, inequality simply kept going up. This divergence between Latin America and much of the rest of the world during the 20th century serves as a valuable reminder of the resilience of highly unequal systems in the absence of violent shocks. For most of human history, societies did not carry within them the seeds for peaceful equalising reform. If the Roman empire had somehow managed to survive indefinitely, it would have produced a never-ending Gilded Age. Without the Black Death, the swings we observe in Figures 1, 2 and 3 would simply not have occurred. But what about the more recent past? One could argue that the modern age has been fundamentally different: after all, industrialisation, urbanisation and democracy have transformed our entire way of life. Which makes it very much worth asking how the distribution of income and wealth might have evolved had the world wars never occurred. This is more than just an intellectual game, for the simple reason that it forces us to think harder about the factors that were in fact decisive in bringing about certain outcomes. Counterfactual analysis is essential in figuring out what really mattered. As it happens, there are good reasons to believe that inequality in a peaceful 20th century would have developed somewhat differently from the four preceding centuries. Even before 1914, a number of Western nations had already begun to experiment with forms of taxation that had at least the potential to curb further concentration. Electoral democracy was spreading, and labour unions had appeared on the scene, even if they were still fairly marginal. Accelerating economic growth would have favoured and sustained mass education, and in turn been sustained by it. Higher productivity also provided the resources required for more generous welfare programmes in healthcare and pensions. This raises the question to what extent the modern wars and revolutions were merely a catalyst that greatly sped up changes that might have happened anyway, only more gradually and slowly. It is highly unlikely that, on its own, economic and social development would have been sufficiently transformative to lower inequality to the levels enjoyed by the postwar generation. As Thomas Piketty argues in Capital in the 21st Century (2014), much of this levelling was a capital phenomenon, and it’s hard to imagine how capital valuations and income could have been as comprehensively slashed if the world had been spared truly dramatic dislocations. Nor is it plausible that peacetime governments could ever have imposed marginal income tax rates in excess of 90 per cent, carved up elite estates, or more generally intervened in the private sector as forcefully as they did during the wars. Rentiers would not have been ruined by runaway inflation. Globalisation would have proceeded uninterrupted, and decolonisation might still be incomplete. Without these wars, without Lenin, Stalin or Mao, no wholesale levelling among the vast share of the world population controlled by them and their proxies would have occurred, nor any equalising policy responses elsewhere to the threat of communist agitation. On balance, even though a less blood-soaked world might well have enjoyed some attenuation of inequality by peaceful means, there is no obvious way in which this process could have reached the scale it did in real life. Finally, what about the present? Recent developments should disabuse us of the notion that the multi-millennial pattern of ups and downs might have somehow ended. 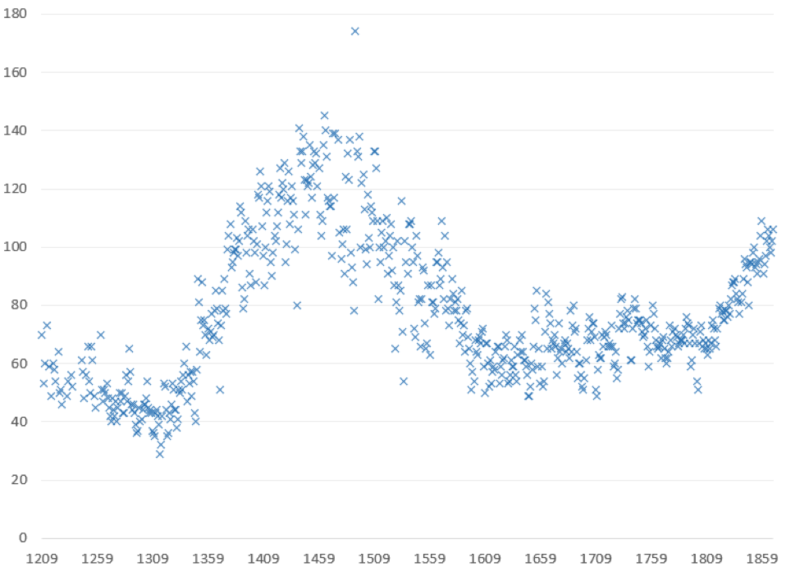 Once more, shock-driven levelling has faded over time, just as it did in Europe after the 8th and the 15th centuries. Almost everywhere we look, inequality has been going up. English-speaking countries have taken the lead, most notably the US. The demise of communism has doubled income inequality in Russia and China, and helped to create enormous fortunes. India has also been moving in this direction. From a world historian’s bird’s eye view, none of this should surprise us. In developed countries, marginal tax rates and union membership have declined. Globalisation, revived after the disruptions of the first half of the 20th century, is booming like never before, opening up new opportunities for investors and putting pressure on mid-level jobs in rich economies. The expansion of the financial sector is also driving unequal gains, while ever-more sophisticated automation augments these pressures by polarising labour markets between low- and high-paid workers. All is not bleak, however. Many European welfare states have managed to offset rising income inequality by ramping up redistribution. Japan, South Korea and Taiwan have been doing a reasonably good job of ensuring a fairer spread of gross incomes. But these are examples of (at best) holding the line, often at great expense, and in ways that might prove unsustainable as rich nations age and immigration threatens to upset social contracts that undergird the welfare state. If we turn to history for examples of peaceful reductions of inequality rather than just the successful maintenance of existing levels, the record is pretty slim. The most important case has been of very recent origin: between 2002 and the early 2010s, most Latin American countries enjoyed a notable diminishment in income inequality, made possible by an unusually favourable concatenation of circumstances. Education reforms finally paid off. Welfare programmes, funded by a commodities boom, supported the disadvantaged, and workers shifted from informal to formal employment. Yet so far, these changes have merely reduced inequality from very high to high levels and, more recently, economic slowdown and political backlash have arrested or even reversed this trend in many of these countries. Only time will tell if peaceful equalisation can be revived and then sustained in the long term. History offers very little comfort to those in search of peaceful levelling. To be sure, it is perfectly possible to reduce inequality at the margins: if Latin American countries have done it, the US, UK or Australia certainly ought to be able to accomplish the same, using an array of policy measures, from fiscal interventions, basic incomes and the targeting of concealed offshore wealth, to carefully focused investment in education and campaign finance reform. However, policymaking does not take place in a vacuum, and not everything that worked well for the postwar generation, say, could be easily implemented in today’s more globally integrated, competitive and deregulated environment. Throughout history, truly substantial compressions of inequality invariably had much darker origins, and no similarly powerful alternative mechanisms have since emerged. It is always tempting to assume that the lessons of history are no longer relevant because the world has changed so much – as indeed it has. But we must bear in mind that the exact same claim could have been made back in the 1950s, ’60s and ’70s, when inequality declined even as economies boomed and the middle classes thrived. There was no obvious reason why this should ever change: and yet change it did. It is just as likely as not that we are currently riding another upward wave in the concentration of income and wealth, continuing a pattern that stretches back thousands of years. In the not-too-distant future, robotics, genetic engineering and biomechatronic enhancements of the human body could well create inequalities we can barely even imagine. And if they do, will it all end in yet another unforeseen, sudden and dramatic violent turn? The Great Leveler: Violence and the History of Inequality from the Stone Age to the Twenty-First Century by Walter Scheidel is out now through Princeton University Press.